Click on the blue music icon above to hear a clip from “Journey” for 5-string electric violin and electronics. I like to escape the dark, cave-like confines of my project studio down the hall whenever possible, and bring my laptop to the dining table. There, in a large open space that includes the living room and kitchen as well, I can work surrounded by lots of light and expanse. Walls with more windows than framing steal my attention away from the pixels at hand, out in one direction to the sea and Catalina Island, and in another across the deck and to the Santa Monica mountains, beyond. Today I was focused intently on an adaptation of a piece, and as if tapped on the shoulder at 5:30, I suddenly lifted my head. And this is what I saw. 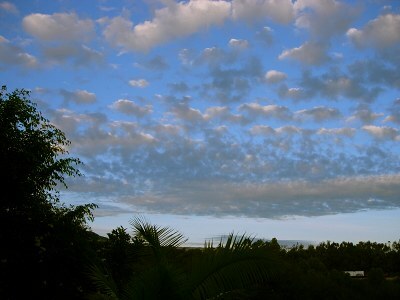 I stepped on to the deck and had to share this view gazing northeast and up… up… up. It made me smile. A big storm is coming tomorrow, but for now, it’s clear and fluffy outside. Click on the blue music icon above to hear a movement from my “Evensong Suite” titled “Phos Hilaron,” to accompany this photo of the way light reflects color on the waves. There is so much color and form here, everywhere I look! 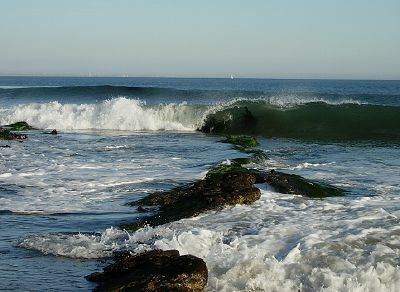 Dark green kelp and eel grass get cycled within the other-greenly green of a wave’s last curl. Blue-ness is followed by more and deeper blue-ness of oncoming tides. The vibrancy is mirrored in a clear, brisk air that smells like these colors. Just think of it. Ahhhhh. 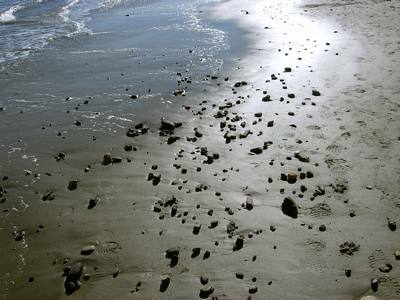 Stones and footsteps strewn at the shoreline. A dance, perhaps, between them, with the waves always cutting in. Some days just look blue, no matter how happy you may be. 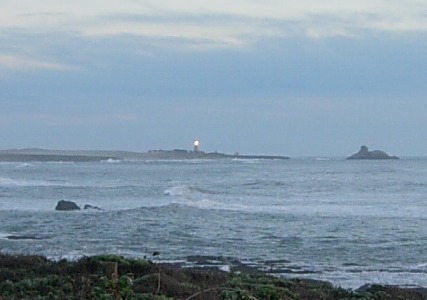 We had a good thunder and lightning storm late last night, and it blew brisk, clear air across the sea. Even though the buffalo-spotted land on Catalina is actually green and brown, gazing across the ocean to it, everything is pale azure and beckons like a lost, magical place. In fact, it’s a found magical place. My trips there over the years, by commercial ferry and by my own sailboat, have all been wonderful discoveries that fill me thoughts of what it might be like to live in such a place, so close to a major city, and yet remote in significant ways. Not unlike our community in Paradise Cove, most natives get around in electric golf carts. And those buffalo I mentioned– I wasn’t kidding. In the 1920’s, a herd of the huge animals was brought over to the island for a film shoot. When the director was done, he didn’t bother to have the [highly non-native!] beasts returned to wherever they came from. Until the buffalo arrived, the largest animal roaming around was the island fox. But the big beasts just love the climate and the food offered up on the grass and scrub brush hillsides, and have bred so well over the past century that now it’s impossible not to see them any time you venture across the little island, grazing on the mountainside or standing right next to the road. Quite a sight! Click on the blue music icon above to hear a taste of “Deep,” to accompany these views of Catalina Island and our Big Blue. Click on the blue music icon above to hear a little from one of my tunes, “Dorian Mood,” to give this surfer something to accompany his nice ride. I don’t watch much TV, because I don’t find much of what’s on terribly fascinating, and also because during peak prime time TV hours I’m either at a concert in town, or composing here in my studio. Evenings and nights are my work days. But there’s one great pleasure I can enjoy 24/7 on cable: an alternative, extreme sports station called FUEL that’s MTV for the board sport crowd. Surfing, skate boarding, snowboarding, X games, motocross, it’s all there, and most of it’s pretty riveting. I love to watch it for a few minutes when I finally hit the sack at 5 or 6 in the morning. I’ve got the TV programmed to start there when I turn on the power, and it rarely leaves that station. It’s just beautiful to watch these athletes bathed in so much joy and exuberance. Best of all, I’m blessed to live somewhere where I can walk outside of my house, and see a line up of guys (and a few gals) waiting for the sets to roll in. And roll in, they do. Some days here at Paradise Cove are moderate and good, like this one I snapped, above. We’ve got nice breaks here, but they’re really for experienced surfers because of all the rocks and sea urchins (see some of my low tide evidence, farther down on this page). And then there are a few really spectacular days every year when the sets come in with waves topping 20 feet, that curl in such a way that you can get a really long ride. 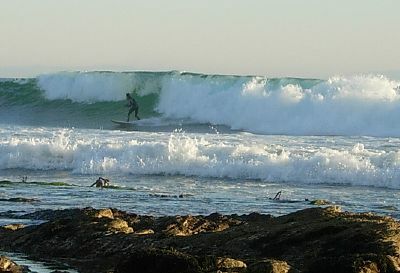 I can sit and watch the surfers forever; it never gets boring and no two sets are alike. There’s the drama of the individuals and their styles, and then there’s the drama of the sea which keeps me guessing about what the next wave is going to look and feel like. Ahhhhh. Far more stimulus than any TV show. And smells better, too. Beach art. 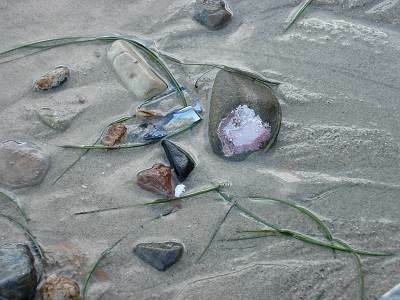 Looking straight down as I walk, there are random, colorful offerings like this pink lichen (even brighter in person) among a few remnants of surf grass, stones and mussel shells. Spread joy like a fungus with algae! Dude! This sea anemone is not a plant. It’s an animal! 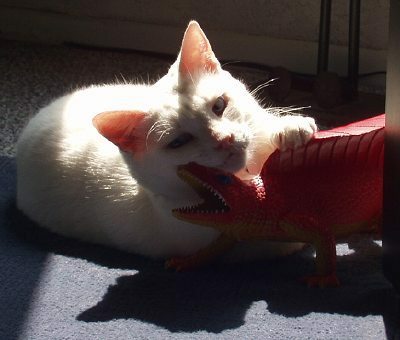 And a predatory one, at that. They eat fish, mussels and even some crustaceans. Usually small ones like tiny shrimp, but not always. 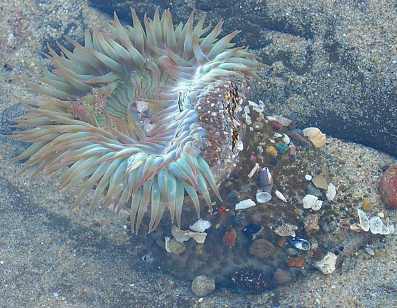 Hands down, the most amazing Wild Kingdom moment I’ve had at this particular beach was a couple of years ago, when a friend and I came upon an anemone about this size– maybe 5 or 6 inches in diameter– eating a small lobster. All that was sticking out were the last few inches of the lobster’s head and antennae. Oh, how I wish I had had a camera with me that day! I haven’t seen anything like that since. On the sides of the anemone’s stalk-like body you can see all sorts of shell detritus that adheres to form a protective covering for this squishy fella. There’s no skeleton; it looks like this when extended, and then collapses on itself into a donut shaped blob as it waits for whatever the tides bring it for lunch that day. Because this particular anemone is in a tidepool under water, it was challenging for me to capture the bright green-blue of it’s tentacles; I think the angle of the sun has to be just right, and it was… just left, perhaps. Nonetheless, I wanted to share the photo with you, because this animal is so beautiful and exposed. Click on the blue music icon above to hear a clip of “Shiny Kiss,” to accompany the moon kissing the mountain ridge. Look up wherever you happen to be this evening: our local rocky satellite in the sky will be reflecting lots of sunlight back to us at night. How cool is that? 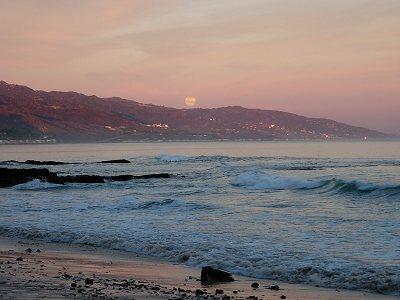 Paradise Cove is a south-facing beach, and we get some very wonderful sun- and moon-rises. Charles and I stood on the damp sand at twilight and as we watched all that green cheese rapidly come into view over the Santa Monica mountains, we allowed ourselves to really feel the earth spinning forward. Living here, I am profoundly aware of existing on a constantly moving object. Growing up in New York City those first 21 years, I never saw moonrises or stars or too much sky at one time. I didn’t have a sense of living on a planet; my dominant perception of the world was geared toward All Things Man-Made. And it all gave me great comfort. My world and values were reflected in the mica mixed into the sidewalk concrete as I looked downward and walked fast through the city streets on my way to somewhere that must have been important to me at the time. Now, the most important place for me to be is right here. My values are reflected in a very shiny place inside my heart that is connected to everything I see around me. Click on the blue music icon above to hear a cue I did years ago for a scary action flick, to accompany these images of Bird Island. We now return you to our regularly scheduled ocean-based pixelsonic blog. Thanks to Smudge the Gravity Cat for taking over yesterday, although entirely without my knowledge, he surfed the web and found some inspiration from Sir Georg Solti, here. 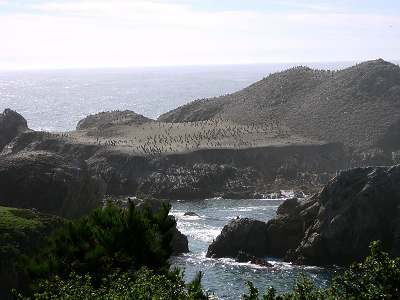 Looking like something seen from one’s pirate ship as it approaches land, just a couple hundred yards in front of the unsuspecting tourist’s feet looms Bird Island, at the southern end of Point Lobos State Park. Viewed from afar, one can barely make out the multitude of black dots scattered across the barren outcropping and on the ridge. 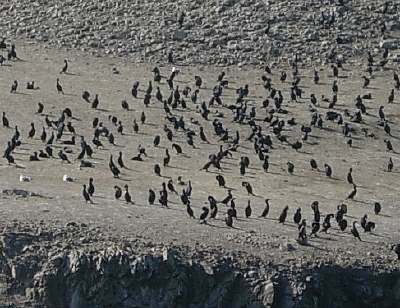 But peering more closely, you can see the details of thousands of cormorants– both Brandt’s and Pelagic– as well as a few squatting gulls enjoying the commotion around them. Click on the blue music icon above to hear a zippy little TV theme from my past life, to welcome in the weekend. Smudge is happy to take over the blogging responsibilities today while I sit here and try to get some more writing done on a new quartet for flute, violin, cello and piano. Thanks, Smudge– next week, it’s Moses’ turn. Ok, Smudge, here you go…. 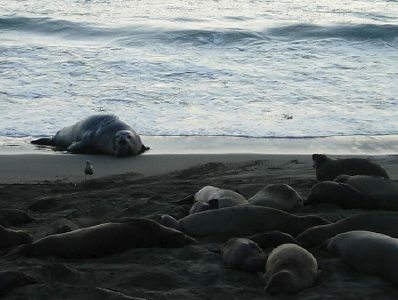 Of the many places to stop by the side of California’s Route 1, I laugh out loud the most when I’m at a narrow stretch of beach near the Hearst Castle and Piedras Blancas, a couple of hours north of Santa Barbara. Don’t miss this if you’re in the area! 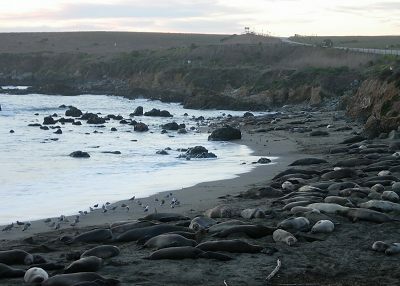 Stepping inches from your car, you will suddenly be standing right next to thousands upon thousands of Elephant Seals hauled out on the sand. Not only is it a sight to behold, but a sound, as well. These creatures– some, at 5,000 pounds, weigh more than an SUV– produce a steady stream of the most incredible noises you can imagine. Grunts, wails, roars, gurgles, high pitches and low, it’s all there, in no discernible order. I should bring my Minidisc next time I’m there, if only to plagiarize for my next piece– it could be one of my best ones. 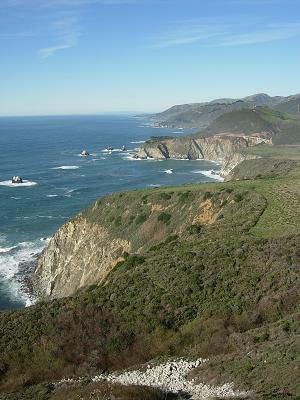 Click on the blue music icon above to hear some of a movement from my “Evensong Suite” titled “Magnificat,” to accompany these photos of Big Sur looking down, and up, the coast. 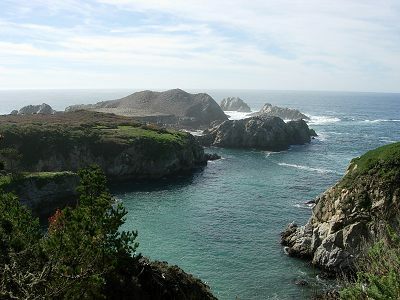 The perfect way to relax after a really fun time working in the Bay area, was a really fun drive the long way down the Western edge of the continent. I never miss an opportunity to do this. 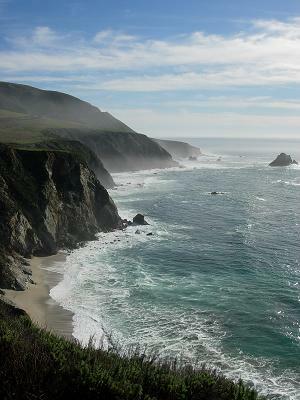 It is impossible to snap a photo of the Big Sur coastline that doesn’t look like a postcard. Proof, above. This February day was unseasonably warm; a hat and sunscreen were needed to stave off the insistent sun, even through a touch of marine haze. For the countless times over roughly 25 years that I’ve taken this drive and collected favorite stopping points, not once have any of them ever looked the same way twice. The air, the water and the smells all change daily. Especially in vibrant places like Point Lobos, below, I barely recognize the coves and tidepools with which I’ve made friends twenty times before. This spot magnetically draws me each time I’m nearby; I even wrote a jazz tune in its honor. Maybe one of the reasons I love the Carmel and Monterey area is that I never know what I’m going to feel, no matter what my expectations might be. Just like composing a new piece. 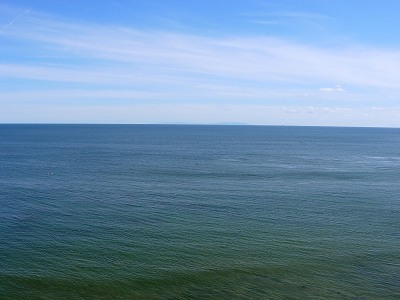 Two unrelated things really amaze me: in each pair, the color of the ocean is green in one photo gazing south, and blue in the other facing north, even though they were taken within minutes of each other. It looked just like this in person, so I’m guessing this phenomenon has to do with the way the sunlight and clouds reflect and refract the light on the water. And the second thing that continues to amaze and awe me is that I live like this. When I returned home this afternoon, as you can see from the header of this blog and many other photos here, it didn’t look wildly different. I cannot get over my great fortune to be surrounded by so much heart-boggling beauty, and that’s largely why I decided to start this blog this year, in order to share it with you. Whoever you are. 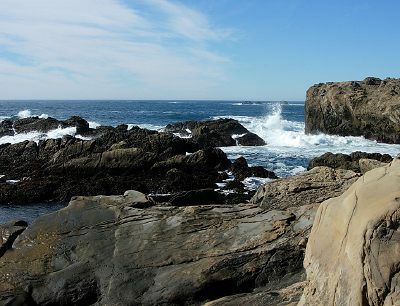 Click on the blue music icon above to hear some of “Point Lobos,” while enjoying photos of… Point Lobos.